Guests visiting Epcot have more than one way to get into the theme park. Tucked away in the back of the park between France and the United Kingdom is the International Gateway, a secondary entrance and exit for the park. The International Gateway opened in 1990 just before Disney’s Swan Hotel opened and was planned so guests of the soon-to-be opened Epcot deluxe resorts would have a “special” entrance in the same way the Monorail provided a unique entrance for guests at the Magic Kingdom deluxe resorts. Those deluxe resorts include the BoardWalk Inn, Disney’s Yacht Club and Beach Club Resorts, and the Walt Disney World Swan and Dolphin. 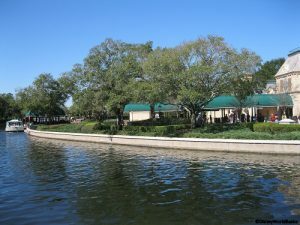 In addition to providing a special entrance for resort guests, the area also provided a completed waterway going all the way to Disney’s Hollywood Studios. Guests arriving to the International Gateway will go through bag check just as they would at the main entrance. Strollers, wheelchairs, and some ECV’s can be rented at the entrance. There is also a locker rental area just inside the gates. Restrooms are located just before the entrance at the International Gateway, and there is also a ticket booth. The dock for the Friendship boats is located before the entrance to the Gateway and guests arriving on the boats have a short walk to Epcot. The International Gateway is a perk when you’re staying in the Epcot resort area. Guests can avoid the hustle and bustle of the main entrance of Epcot in the morning (after enjoying a leisurely walk from their hotel), and they also have an easy exit to the Boardwalk area and the resorts after IllumiNations ends. This entry was posted on Wednesday, June 11th, 2014 at 12:00 pm	and is filed under Hotels, How To, Planning, Theme Parks, Transportation. You can follow any responses to this entry through the RSS 2.0 feed. You can leave a response, or trackback from your own site.